As part of the landmark development Millenia Singapore, the 3-storey retail mall Millenia Walk is conveniently located to cater all lifestyle and fashion needs of Marina Bay's executives and business travelers. In this impressive architecture designed by Pritzer Architectural Prize Laureate Philip Johnson, you can expect flagship stores of Harvey Norman electronics and Cortina Watch Espace, Asia's largest watch gallery. 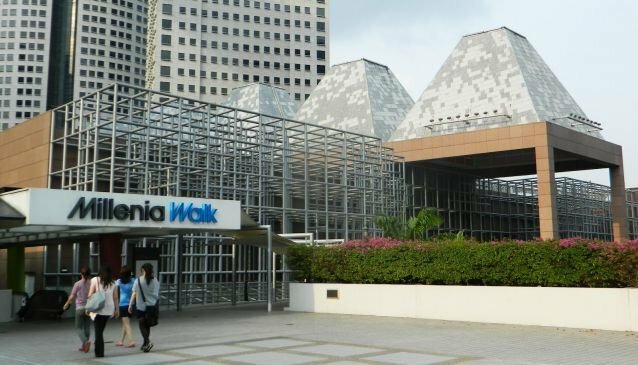 The mall is also home to PARCO Marina Bay, the first fashion and lifestyle store outside Japan. Plan in a visit at the Chinese Heritage Foundation, located on the second floor. It is an interesting mix of shop, gallery and museum, showcasing authentic Chinese heritage items. For gourmands looking for food pleasures in the Marina Bay area, the shopping mall features a 280-metre-long food street by the Monument Square, which is the only Park and Dine concept in Singapore. Services available: Sistic agent (Mon to Sat 10am to 8pm; Sun and PH 12pm to 8pm) at the Service Desk, level 1. Complimentary Cellphone charging.